So last week I posted some information on one of my favorite herbs, Lavender. In that post I mentioned that it's used in French cooking, particularly in a blend called Herbs de Provence. So I figured I'd share my recipe for this amazing blend, and a few recipes that use it. I hope you enjoy! This is the most basic form of this herb blend. If you want to be a little more adventurous or fancy, you can try adding in 1 tsp of dried fennel seed, 1-2 tsp of dried orange zest, or 1-2 tsp of dried lemon zest. Feel free to play around with it and make it your own! This particular recipe makes about 1 cup of spice blend so make sure you have a container that can hold that amount. Use a mortar and pestle, food processor, or coffee/spice grinder to lightly grind any of the whole herbs. You want them to be coarse and not finely ground. Combine all the herbs in a bowl and mix well. Store in an airtight container away from heat and light. So now that you have this amazing herb blend, what do you do with it? This blend works well with all meats, particularly poultry and fish. It also goes great on root vegetables such as potatoes, and it makes a great herbed butter or infused olive oil. 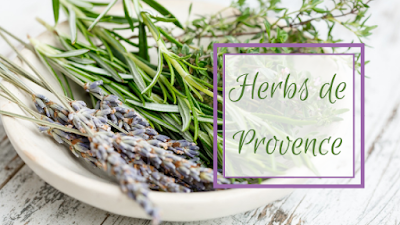 Here are a few of my favorite recipes using Herbs de Provence. This salad dressing is so amazing, and super easy to make and uses Herbs de Provence and Dijon mustard to make your taste buds feel like you're dining in Provencal France! Combine all ingredients, except olive oil, in a food processor. Process away for about 1 minute. Slowly drizzle in the olive oil (my food processor allows me to do this while actively processing the dressing, this is the best way to incorporate the oil, but if your processor does not, just drizzle a little at a time and process for 30 seconds between drizzles). Your dressing should be nicely emulsified and ready to store in the refrigerator. Chill for 1 hour before serving to allow all the flavors to nicely combine. Lentil soup is a staple in my household. It's super easy to make and really quick if you're in a pinch for time. This version uses French lentils and Herbs de Provence to make a soup that's out-of-this-world! In a large pot, over medium heat, heat the olive oil. Add onion, celery, carrot, and garlic. Cover and cook until softened, about 5 minutes. Stir in vinegar, lentils, broth, and all seasonings. Bring the mixture to a boil, then reduce to a simmer. Simmer, covered, about 30 minutes. Add in the red onions and cover, cook for an additional 15 minutes, or until the lentils are softened. Taste and adjust the seasonings if necessary. About 5 minutes before serving, stir in the Swiss Chard. Serve piping hot! This goes great over rice and/or quinoa. This recipe shows off how well Tofu can blend with just about everything. Now, for those of you who prefer meat, you can substitute chicken for tofu (just make sure it's fully cooked, it might take a bit longer than tofu) and get a delicious main dish, or simply take out the tofu and get a wonderful side dish of root veggies with gravy. In a large pot, on high heat, begin to boil the potatoes, carrots, parsnips, and celeraic. While the root veggies are cooking (about 15-20 minutes or until fork tender), heat 1 tablespoon of olive oil over medium-high heat. Add onions and garlic and sautee until tender, but not translucent. Add in the tomatoes, 1 teaspoon of Herbes de Provence, ½ teaspoon of salt, and ½ teaspoon of pepper. Cook about 5 minutes. Add in the broth and simmer, uncovered, about 10 minutes. Lower the heat to Low, add in the flour and whisk well to incorporate. Once the mixture thickens, set aside. Once the root vegetables are tender, drain them and set them aside. In another skillet, heat the remaining olive oil over medium-high heat. Slice the tofu into ¼ inch thick triangles. When the oil is hot, add the tofu. When the bottom is nice and crisp, flip them and add the root vegetables. Season with the remaining seasonings and cook until everything is golden. Pour the broth gravy over the tofu and roots and serve. In any of these recipes, feel free to change the ingredients around. Play with different veggies and herbs. I hope you enjoy this Herbs de Provence recipe, and have fun using it in every dish! Have fun, play around, and let me know what you think below!